We can ship to virtually any address in the world. Handling time is between 1-3 business days for all products in store. Shipping in the USA via USPS first class is FREE. 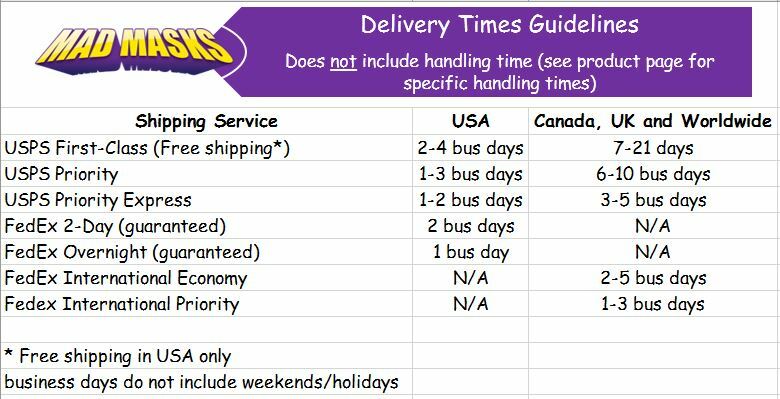 If you would like a faster shipping method via USPS or FedEx, please be sure to select and pay for that option. Packages received via "Return to Sender" may be shipped out again at buyer's expense. Mad Masks is not responsible for package damage or loss by mail carrier, or package theft. Your satisfaction is guaranteed. If you are not satisfied with your purchase for any reason, simply return the unworn item(s) within 14 days for a full refund (less postage). Mad Masks reserves the right to inspect returned item(s) and refuse a refund if item(s) appear in used or poor condition. Please note that there are no returns on special orders, commissions and clearance items.